I mostly followed the advice in the Make article. The major problem I encountered was what camera to use. I didn’t want to risk damaging anything expensive, so I opted to use a $30 CVS “one-time-use” video camera. 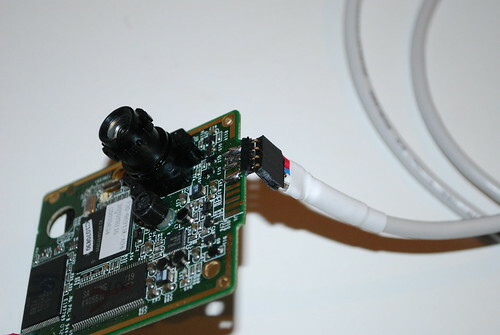 The Camera Hacks forum has useful information to get around CVS’s security and make the camera reusable. I removed everything but he bare essentials of the camera to reduce its weight. Following the instructions on the Camera Hacks forum, I soldered headers onto the camera for a USB connection. 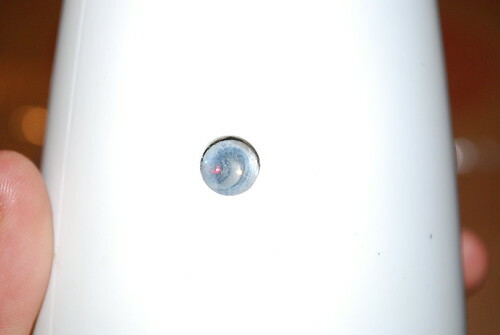 I attached the camera to the rocket by gluing standoffs into the nose cone, and screwing the camera into the standoffs. 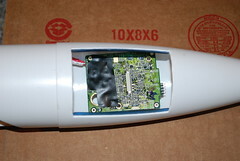 With the help of jbgizmo.com I built a cheap lightweight altimeter that uses a pressure transducer to calculate altitude. 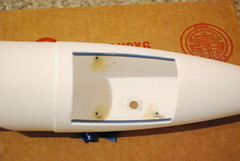 With a hole drilled in the nose cone the final result looks like this. I launched the rocket once with the camera and once without. Both launches had the altimeter. The launch with the camera used a D12-5 engine and reached an altitude of 420 feet. The launch without the camera used a E9-4 engine and reached an altitude of 835 feet. See more pictures of this project on flickr. This entry was posted in Rockets. Bookmark the permalink.